Born and raised in the West Indies, Hamilton came to New York in 1772 at age 17 to study finance at King's College (now Columbia University). Hamilton became a supporter of the cause of the American patriots during the political turmoil of the 1770s. Commissioned as a Captain of Artillery at the beginning of the American Revolution, he soon became an aide-de-camp to George Washington. After the war, as a member of Congress, Hamilton was instrumental in creating the new Constitution. As co-author of the Federalist Papers he was indispensable in the effort to get the Constitution adopted. As the first Secretary of the Treasury (1789-1795) he devised plans for funding the national debt, securing federal credit, encouraging expansion of manufacturing, and organizing the federal bank. 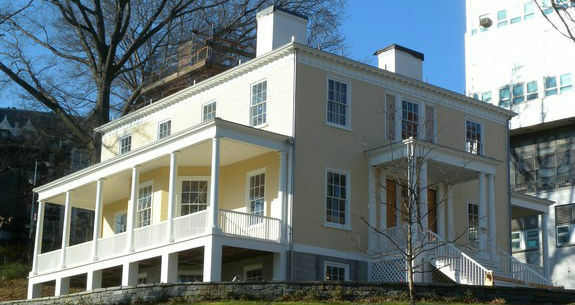 Hamilton commissioned architect John McComb Jr. to design a Federal style country home on a sprawling 32 acre estate in upper Manhattan. This house was completed in 1802 and named "The Grange" after the Hamilton family's ancestral home in Scotland, but served as his home for only two years.